Super Exclusive & Extremely Rare. RARE & EXOTIC SPECIAL EDITION. 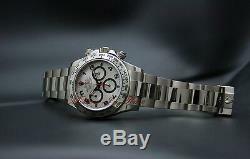 Rolex Cosmograph Daytona White Gold on Bracelet. Rarest Model w/ Silver Arabic Dial & Red Accents. You WILL NOT See Many of These Around! Unworn Complete with Box & Papers. Exotic - Rare - And Absolutely Breathtaking! Super Exclusive Cosmograph Daytona from Rolex. A powerful & striking watch - will definitely draw attention & makes for a great conversation piece. No doubt - One of the most sought after Rolex watches ever released. The Rolex Daytona white gold with an extremely rare Silver Arabic Dial with red accents is a perfect balance of sporty and elegant. The Daytona is the most coveted watch in all of watchdom and once you strap one on, you will understand why. So comfortable you will forget you are wearing it and so nice looking you will wonder why those people are staring at your wrist! The case is white gold with dimensions of 40mm diameter by 12.8mm thick. Crown and chronograph pushers screw down. Water resistant to 100 meters. Bracelet is the full length Oysterlock in 18kt White Gold. Bezel is engraved with the Units per Hour scale from 60 to 400. Movement is the outstanding Rolex automatic winding Caliber 4130. Rolex designed and built this caliber as the best chronograph movement that could be manufactured. They concentrated on technical excellence (long lubrication life, long service intervals and minimizing friction), timekeeping excellence C. Certified Chronometer and serviceability (the watchmakers can service and/or repair the caliber easily). The Oyster Perpetual Cosmograph Daytona is resolutely dedicated to those who enjoy the finer things in life. The typical owner of this Rolex chronograph, designed with speed and performance in mind, is among those who avidly take advantage of all that life has to offer, love the freedom of the open road and are not afraid to take the turns tightly. 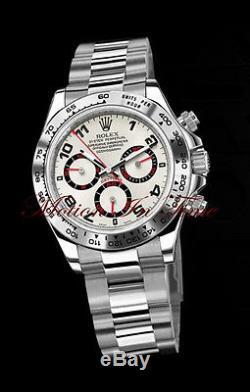 Speed and Motorsports Launched in 1963, the Rolex Cosmograph Daytona is closely linked to speed and motorsports. Its automatic chronograph movement allows short periods of elapsed time to be measured to within 18th of a second, and the tachymetric scale on the bezel enables the instant reading of speed over a given distance. Adopted by race car drivers for its performance, reliability and exceptional readability, this prestigious chronograph carries in red letters on its dial the name Daytona the most famous race track in the United States. Two Years from M otion in Time. PLEASE ALSO CHECK OUR OTHER ITEMS.. Motion in Time is not affiliated with Rolex & is not an official Rolex Dealer. Or any other watch company, and is not an official. Is the sole warrantor of these watches. Is not affiliated with any watch maker. CHECK OUR OTHER AUCTIONS FOR MORE GREAT DEALS! Is a full-service watch and jewelry store located at 56 West 47 Street, New York, NY 10036 (Between 5th & 6th Avenues). We are members of the International Watch & Jewelry Guild (IWJG). We are located in the Heart of the New York Diamond District in Manhattan. Our main goal is a simple one. "Treat our clients as we would like to be treated ourselves". By adhering to their safety regulations, we are able to conduct safer business and as a result sell our items at lower prices. We do not mark merchandise values below value or mark items as "gifts". And International government regulations prohibit such behavior. Please check to make sure that the watch you are purchasing is the make and model which you are looking for. Under certain circumstances, an advertised item may be out of stock. Please note that some watches are on memo or offered to us from other dealers. The item "Rolex Cosmograph Daytona White Gold on Bracelet with Rare Silver & Red Dial 116509" is in sale since Wednesday, August 26, 2015. This item is in the category "Jewelry & Watches\Watches, Parts & Accessories\Wristwatches". The seller is "motionintime_ny" and is located in New York, New York. This item can be shipped worldwide.